This is our “Providers” column from the March 2012 issue of Bon Appetit — on newsstands today. Please head over to their site for the brussels sprouts recipe. Photo by Romulo Yanes for BonApp. Nope, sorry, not even bacon can salvage the sprout in our house even for the adults. adore brussels – shredded, roasted, sauteed. can’t get enough. The transformation of the brussels sprout in my life has been the most dramatic of any edible item! I remember vividly staring down at the single steamed little cabbage on my plate, which I would eventually choke down in order to leave the table. Nowadays we roast them at high heat with lots of olive oil and salt and simply cannot get enough. They are divine! Your recipe looks great but features too many elements for my purist, picky eaters. As it is now, they’ll eat the “chips” – crispy outer leaves – and that’s it. But I’ll take it. As far as I remember, I never ate a brussel sprout in my childhood. Probably one of my parents couldn’t stand them, so we never had them. However, we tried them as a family a few years ago when my daughter was intrigued by the stalk with the little sprouts on it. (I think buying them on the stalk adds to the mystique, by the way). We love them roasted with a little salt. Also with cheese sauce, which is cheating as far as nutrition goes, but hey, you get the vitamins under that fat anyway, right? We’ll have to try it with bacon bits, that sounds yummy as well. I’m an advocate of the “just keep trying” school when it comes to weird foods. We have a big age range (5 to 14) in our family, and what the little girls won’t eat now, the older kids are more willing to try, so things just keep showing up on the table and eventually (sometimes!) new favorites are found. When I was a kid, one of our rules of dinner was that we had to eat at least a bite or two of everything that was served, and brussels sprouts honestly evoked my gag reflex. I found a recipe in the Washington Post a few years ago for jullienned brussels sprouts with bacon (1 pound of bacon) and carrots. 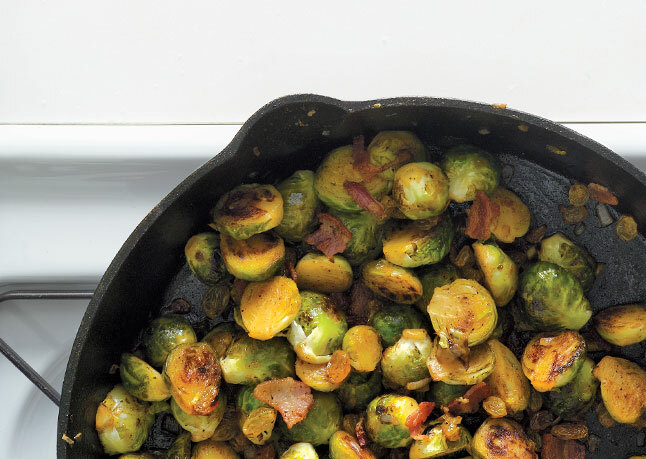 Since then they are featured at every Thanksgiving, and brussels sprouts served any way conjure the flavor of bacon. That dish got me over the hump, and I make them all the time now, most of the time just with some garlicky brown butter. LOVE that recipe from Momofuko. Totally revolutionized Brussels sprouts for us. Long live the sprouts, and long live the sprouts eater. Made this last night – DH said they were the best sprouts he’s had. Thanks! My husband and I were delighted to read this! We can relate on so many levels (mortgage, two children, dog, etc.) and we’re excited to try a fancier version of our lower-brow brussels sprouts solution which includes red onion, bacon, and lemon juice. (We love shallots, but, hey, red onions are easier on the grocery budget.) The golden raisin inclusion is brilliant and just might seal the deal for our toddler. At first I thought a Bon Appetit subscription would just make our mouths water and wouldn’t actually provide any reasonable recipes for two working parents, a toddler, and an infant… now that we’ve attempted several recipes and found your blog, I’m patting myself on the back for subscribing!! I adore brussel sprouts (even without bacon) but this recipe was no bueno. They were still hard as a rock after simmering in the broth and the flavors were weird. 🙁 wished i had simply roasted the sprouts instead. sigh. I just discovered your blog and I have to say I am hooked, have been reading for the past 24 hours almost non stop! LOL! I guess I was the weird kid on the block, but I love brussels sprouts. Just steamed with butter and a little salt is how I have eaten them most often. But I also like them with bacon and toasted walnuts yummm! This is almost exactly our brussel sprouts story too! Hated them as a kid and young adult, finally saw the light in my late 30s. And now they are one of my favorite veggies. Your brussel sprouts and coconut rice recipe is one of my all time favorite dinners! !